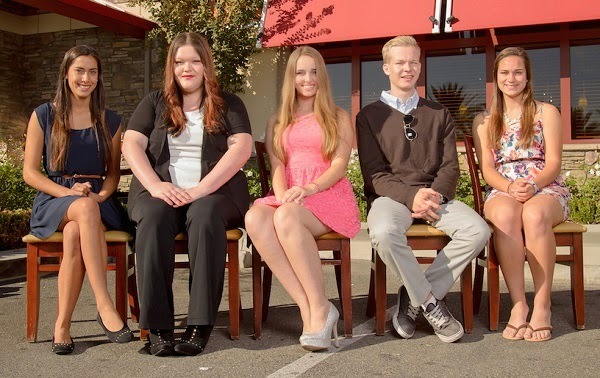 The Murrieta Chamber of Commerce announced their high school students of the month. The High School Student of the Month Recognition Program was held on October 23 and six students were selected, one from each high school. Out of Murrieta Mesa High School, McKenna Bartlett was selected. Not always the best student, things changed when she got in the AVID program, which helped get her back on track. Now a member for the past four years, she is also a member of the California Scholarship Federation. Her activities include being a member of the Robotics Club and captain of the school softball team for two years. She has participated in Race for the Cure, walked for multiple sclerosis, and worked at the Salvation Army. McKenna has applied to Cal Poly San Luis Obispo to earn a degree in architectural engineering. Creekside High School's Student of the Month is Ashley Hurst. She is considered a quiet person, but she has big hopes for her future. She will be graduating early in December and plans to attend Mt. San Jacinto College for two years. After that she plans on transferring to USC and hopes to be able to attend medical school. Out of Murrieta Valley High School, the student selected was Sienna Schmolesky. She has been a member of the ASB for two years, last year serving as the junior class president and this year as Commissioner of Staff Relations. Currently, she is ranked first in her class, with a 4.34 GPA and has taken 10 college level courses. Sienna is also in the International Baccalaureate program, National Honor Society, and Blankets for Babies Club. Her goals is to attend UCR and study biomedical engineering. From Calvary Murrieta Christian High School, Tiffany Escorcia was selected as student of the month. Having a passion to travel the world, she is involved in her school's missions programs and has taken missions trips to Haiti, Belize, and Mexico. She is a member of National Honor Society, and currently Vice President for ASB. Representing River Springs Charter School, Curtis Hohl was selected as the student of the month. Curtis is home schools and has taken classes at Crafton Hills College. He has a heart for the mentally-challenged and is involved in a disability ministry at his church. He has also gone on trips to Mexico to build houses. Calvin also works at Riley's Farm doing history reenactments. He has already been accepted to Cal Baptist University where he plans on majoring in software engineering. Representing Vista Murrieta High School, Megan Dimler was selected as student of the month. She is known for being outgoing and funny, but she is also humble about her accomplishments. She serves as the Commissioner of Pep in her fourth year as a member of ASB. Megan is the captain of the varsity volleyball team and also runs in track and field. She wants to attend college in Montreal, Canada, and major in political science and international relations. She also hopes to be able to spend a year abroad..